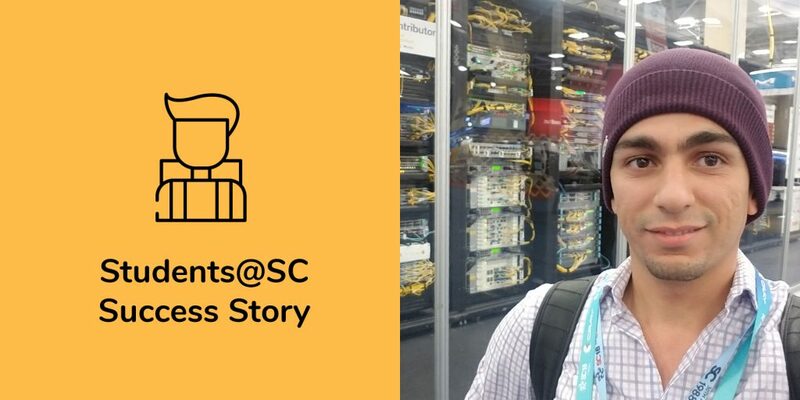 Hussein Al-Azzawi, a network and storage specialist and doctorate student at The University of New Mexico, has been an SC conference attendee every year since 2014. In 2018, he applied to become a student volunteer for the first time and was accepted into the SCinet program, where participated in the Fiber, Wide-Area Network (WAN) and Routing teams. As a volunteer, what Hussein found most surprising was the interaction between everyone, especially people he long admired for their professional accomplishments and considered “unreachable.” In looking back at his SC18 experience, Hussein recounted a few events that truly stood out. Every year after setup week, SC organizes a 5K run, and Hussein chose to do it. During the run, he found himself chatting with another volunteer about the event, staging and things to come. After a couple of kilometers, Hussein asked his running partner about what he was doing at the conference and discovered he had been keeping pace with the SC18 Chair, Ralph McEldowney. Hussein noted he was startled by McEldowney’s open, easy-going and humble nature. Another memorable effort happened during the program set-up. Hussein admitted he “never thought a CTO would do things like that.” This instance comforted him as he likes the hands-on part of Information Technology. Then, right there in front of him at SC, Hussein saw that even as you climb the corporate ladder, you can still troubleshoot. Hussein also participated in the SC Mentor–Protégé Program and attended the official dinner. At the dinner, tables were displayed with topics of interest and featured representatives from U.S. national laboratories and private vendors. Students were encouraged to go table to table to meet with, as Hussein called them, “superstars” (“نجوم”). Hussein met a recruiting agent for a national laboratory and continues to be in contact with her via LinkedIn. He also met Eli Dart, a network engineer with ESnet, and used their time to talk about education and what kinds of openings would be available to someone like him. During this conversation, Dart shared how he became what he is today and emphasized the difference between education and knowledge. “It was like visiting with a celebrity,” Hussein said. Hussein also bumped into a professional who happened to have shared the same co-advisor. That man has become an example of who Hussein aspires to be. Prior to the SC18 conference, Hussein had doubts about his career path. When he left, he had a very positive outlook toward the future, as well as a pocketful of professional contacts he once thought were inaccessible. That engagement alone with so many “superstars” assured that Hussein would volunteer again for SCinet 2019. “I feel like I am not doing something wrong, I know it is possible now, and I also believe I am on the right path,” he added. Inspired by Hussein’s story? Learn how you can apply to be a student volunteer and the many other opportunities available to students through the Students@SC program. Christine Baissac-Hayden created Easy English 4 All, which provides multilingual communication tools for clients from diverse backgrounds in the renewable energy, medical, defense, marine science, and film industries. Easy English 4 All provides English as a Second Language (ESL), French, Spanish and Japanese tutoring from certified native-speaking teachers and organizes international student exchanges with personalized objectives and goals.